signal with higher available air flow at the output. 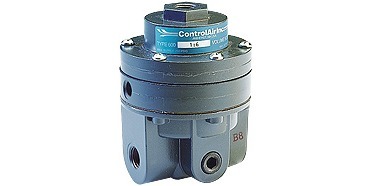 A volume booster is employed in a pneumatic control system to reproduce a low flow control signal with a higher regulated flow output pressure. It uses an unregulated input pressure to maintain a regulated output pressure under flowing and non-flowing conditions. Many applications exist, a common one being a valve actuator which may require a substantially larger air flow rate than can be delivered by the control signal. The volume booster will reproduce the pressure of the input signal at its output, but with a larger available flow rate available from an independent source. The volume booster is connected to the air supply line, with the output routed to whatever device is to be controlled. The control signal to the volume booster originates at another device, such as a transducer, valve positioner or other control means. This pneumatic input signal serves as the output pressure setpoint for the booster. The volume booster regulates the flow from the supply line to deliver the sepoint outlet pressure, while allowing the booster to flow the maximum volume of the supply line. Boosters may also be referred to as pilot-operated regulators, as your control or pilot signal maintains the outlet pressure control. The regulated output of a pneumatic volume booster can be any of several options to match the driven device requirements. The volume booster ratio is the multiplier or divider of signal pressure to output pressure. For example, a 2:1 ratio means output pressure is 1/2 the signal pressure. Similarly, a 1:2 ratio would provide output pressure twice the signal pressure. The actual output pressure, regardless of the ratio, is limited by the supply pressure. There is substantial flexibility in the configuration and variants of volume boosters, enabling selection of the right unit for every application. Share your pneumatic control system challenges with process automation specialists, leveraging your own knowledge and experience with their product application expertise to develop effective solutions. Volume Booster for Pneumatic Control Systems from Hile Controls of Alabama, Inc.